Protest: Young children playing with jigsaw puzzles when refugee advocacy groups Love Makes A Way and Mums 4 Refugees transformed the street entrance of the Department of Home Affairs in Brisbane into a giant play area to demonstrate what they consider children on Nauru should be doing – playing and learning. THE Australian government is poised to move all children now held in immigration detention on Nauru to Australia by the end of the year. Former attorney general, George Brandis, now the high commissioner in London, confirmed the plan in an interview with LBC radio. “There are hardly any children on Nauru and in New Guinea and we expect that by the end of this year there will be none,” Mr Brandis told LBC radio. The plan appears to go some of the way in answering an Australia-wide community outcry for action to move children off Nauru, including campaigns spearheaded by charities, human rights groups, medical and legal organisations calling on the government to evacuate the children on Nauru to Australia or New Zealand. Doctors have warned of increasing mental health problems. Government sources have confirmed to the ABC there are now 40 asylum seeker children on Nauru – down from 52 last week. 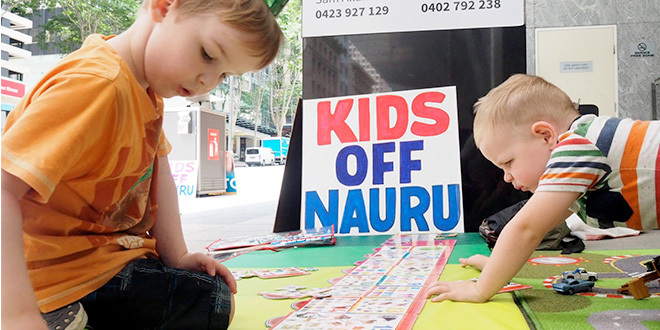 Yesterday, the refugee advocacy groups Love Makes A Way and Mums 4 Refugees transformed the street entrance of the Department of Home Affairs in Brisbane into a giant play area to demonstrate what they consider children on Nauru should be doing – playing and learning. Love Makes A Way community organiser and educator David Fittell said there was “no reason children couldn’t be released from Nauru immediately”. “… As an educator and grandfather, I’m appalled that our government is keeping little kids out of school and trapped on an island prison when they should be able to play and learn and thrive,” Mr Fittell said. He said it was important to know exactly where the government intended sending the children. “What are the kids going to be released into?” Mr Fittell said. Queensland convenor of Mums 4 Refugees Sally Dodds said that all children had a right to live in peace, safety and freedom. “We want children and their families evacuated off Nauru now,” Ms Dodds said. The treatment of refugees and asylum seekers is a worldwide issue, and has plagued successive Australian governments. Pope Francis has told nations to prioritise the safety of asylum seekers over national security. In a statement last August, he urged countries of migration to provide newcomers with health services, education, pension plans, a minimum amount to live on and the ability to open bank accounts. Children, he said, “must be spared from any form of detention related to migratory status, and must be guaranteed regular access to primary and secondary education.